Obtaining a Hamilton or Grimsby mortgage can be overwhelming for any first-time homebuyer. With multiple different loan options available on the market today, our team at Canadian Mortgage Authority understands how confusing it can be trying to pick the best option for your financial situation. This is why we are devoted to educating every homebuyer who works with us, so they can confidently choose the mortgage they want. So, to help you get started, our team of experts have listed the difference between two of the most common mortgage options: fixed and variable rate mortgages. A fixed-rate mortgage is one where you are given a set interest rate that will not fluctuate throughout your loan’s term, which can range from 6 months to 10 years. This means your rate and payment will stay the same even if the interest rates increase. Due to the security of not having to worry about your monthly payments increasing for the term of the mortgage, the interest rates for a fixed-rate Hamilton or Grimsby mortgage are generally a little higher than variable rate mortgage, except when compared with an open mortgage. The rates for a fixed-rate mortgage are known to be lower than an open mortgage, which is why this option is so popular. Other benefits include payment stability. With this type of mortgage, you will know exactly how much you owe towards your mortgage and how long it will take you to pay it off, therefore, you can accurately budget your finances. A variable rate mortgage is based on the current Prime Rate, which is why the initial interest rate of this mortgage is typically lower than a fixed-rate mortgage. Depending on your lender, your monthly payments will fluctuate with the market, meaning, your rate could increase or decrease multiple times throughout your loan’s term. If the market changes and the rates drop, you could reap the benefits of making a lower monthly payment than originally expected. However, if the rates get more expensive, this could negatively affect your monthly bill. 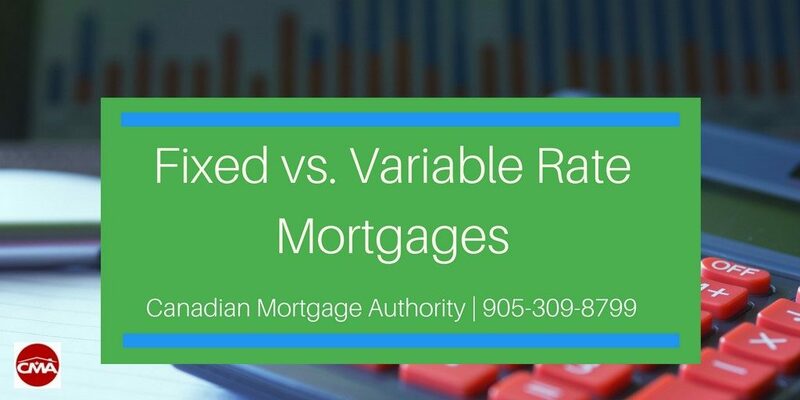 For more information on the difference between fixed and variable rate mortgages, or to get started on your mortgage application, please contact your local Grimsby Mortgage broker, the Canadian Mortgage Authority Team, at 905-309-8799.